Kimi Raikkonen set a new track record at the Italian GP. 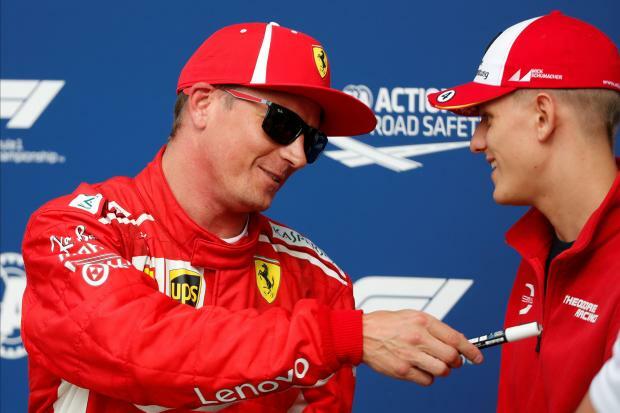 Kimi Raikkonen put Ferrari on pole position for their home Italian Grand Prix with Formula One’s fastest lap ever on Saturday. Unhappy team mate Sebastian Vettel completed the front-row sweep for Sunday’s race, with championship leader and 2018 winner Lewis Hamilton a close third for Mercedes. Raikkonen’s stunning lap of one minute 19.119 seconds, at an average speed of 263.587 kph, smashed the track record of 1:19.525 set by Colombian Juan Pablo Montoya for Williams at Monza in 2004. “I couldn’t think of a better place to be on pole,” said Raikkonen, who appeared to benefit from an aerodynamic tow after running behind his team mate on track. Vettel ended up 0.161 slower. It was the Finn’s first pole position since Monaco last year, the 18thof his career and Ferrari’s first at Monza since 2010, when they last won at the track outside Milan. The 38-year-old, who has not won since he was at Lotus in 2013, also became the oldest pole-sitter since Britain’s Nigel Mansell in 1994. Ferrari’s last front-row lockout at Monza was in 2000, when Michael Schumacher and Brazilian Rubens Barrichello were first and second on the grid. Vettel thought he had the pole and exclaimed ‘Yes!’ as he crossed the line only to be told he was second fastest to the team mate following behind. “We speak later,” he said. “Clearly I wasn’t happy but I don’t tell you why,” explained the German when asked by reporters later what he planned to discuss. “To be honest it was not a tidy lap and I think the other laps were actually better ones,” said Vettel. “I lost time pretty much everywhere. Hamilton, who was booed by some of the Ferrari fans with their banners and flags dominating the main grandstand, had been fastest after the session’s first flying laps—also with a record time—and congratulated Raikkonen. “We knew they had the pace this weekend and it was going to take something special to catch them. It’s generally been that gap all weekend. It was amazing how intense it was and that’s how racing should be,” said the Briton. Hamilton’s team mate Valtteri Bottas joined him on the second row, with Red Bull’s Max Verstappen fifth and Romain Grosjean sixth for Haas. Canadian Lance Stroll, whose billionaire father now owns the Force India team, gave struggling Williams their best qualifying of the season with 10thplace. “We didn’t expect that, we expected a much more challenging situation but the car felt good, we managed to get a good tow throughout qualifying and that helped us,” said the teenager. McLaren’s Belgian Stoffel Vandoorne, whose team mate Fernando Alonso clashed on track with Haas driver Kevin Magnussen in the second phase of qualifying, could not say the same after setting the slowest time. He will avoid starting at the back of the field, however, with Red Bull’s Australian Daniel Ricciardo, Renault’s Nico Hulkenberg and Sauber’s Marcus Ericsson all having grid penalties.